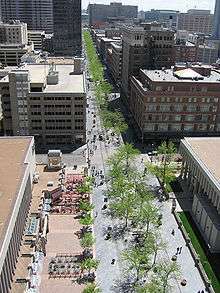 The 16th Street Mall is a pedestrian and transit mall in Denver, Colorado. The mall, 1.25 miles (2 kilometers) long, runs along 16th Street in downtown Denver, from Wewatta Street (at Union Station) to the intersection of 16th Avenue and Broadway (at Civic Center Station). 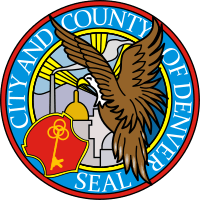 It is home to over 300 locally owned/chain stores, over 50 restaurants, and the Denver Pavilions. The 16th Street Mall opened in 1982, originally from Market Street to Broadway, and was designed by Pei Cobb Freed & Partners, with Henry N. Cobb as design partner, in collaboration with the urban design and landscape architecture firm, OLIN. The mall was extended from Market Street to Wynkoop Street in 2001 and to Union Station in 2002 to coincide with the completion of the Central Platte Valley (CPV) light rail spur. Before 1982, 16th Street was still a shopping and business destination that was home to four major department stores and many office buildings. Currently, the 16th Street Mall serves as a nexus for the major businesses downtown as well as the various tourist attractions that are nearby. Traditionally, street performing has been very popular on the mall, with many local folk, country, and vocal musicians gaining recognition in pop culture. Other types of performers, such as dancers, actors, impressionists, and comedians have also used the popular location as a prime venue for discovery. A free shuttle bus service, operated by the Regional Transportation District (RTD), is known as the MallRide. From 1982 to 1999, the MallRide fleet used front-wheel-drive and right-hand-drive buses that were custom-designed and purpose-built. The right-hand-drive gives the operators better view of passengers entering and exiting the buses from the right-hand side and to watch out for the pedestrians. These buses can travel up to 25 mph (40 km/h) on the street and must deal with the 'wandering' pedestrians on the sidewalks who get too close to the buses. RTD went back to the drawing board and started the bid process anew. Many bus or heavy vehicle manufacturers rejected the RTD's exact specification due to the low number of buses to be manufactured and "unproven" hybrid technology (especially in the late 1990s and early 2000s). Only Neoplan and a startup company, Columbine Bus, submitted proposals. Columbine Bus was formed by two engineers with electric vehicle backgrounds. Although Columbine Bus won the $11.7M contract they were not able to secure the needed funds to go into production. In those years the investment community did not see any future in electric or hybrid-electric vehicle technologies. Columbine Bus was soon acquired by TransTeq, to build the hybrid-electric MallRide buses. RTD worked very closely with TransTeq with almost daily visits to the nearby manufacturing facility. The second-generation MallRide buses are called EcoMark and use the 70 hp (52 kW) 1.6-litre compressed natural gas Ford engine that drives the generator on demand. The generator in turn provides the electrical power to the two electric motors. The batteries are recharged by both regenerative brake power and generator on demand. EcoMark MallRide buses have extra doors and more standing room than the first-generation MallRide buses. The operators continue to drive on the right-hand side as they did in the first-generation. In August 2015, the RTD approved a contract to purchase a fleet of 36 all-electric buses from BYD. MallRide stops at every intersection between Union Station and the 16th Avenue/Broadway intersection, with two stations—Union Station (at 17th Street and Wynkoop Street) and Civic Center (at 16th Street and Broadway)—providing key connections to other RTD buses. Market Street Station closed in May 2014, with the opening of the Union Station Transit Center. In addition, MallRide provides connections to light rail. Connections to the C Line, the E Line, and the W Line are at Union Station. Connections to the D Line, the F Line, and the H Line are at 16th/California & 16th/Stout stations. As part of the May 2014 Union Station Transit Center opening, RTD introduced the rush hour Metro Ride service with limited stops between Union Station and Civic Center Station. Other transportation alternatives to the MallRide on the 16th Street Mall include Pedicab Services and horse drawn carriage, B-Cycle bike-sharing, and various car-sharing operations. The Project for Public Spaces says of the Mall that it "provides the entire downtown with shuttle bus circulation and high quality pedestrian access to Union Station. However, its success as a place has to do with its edge uses, over 300 shops and 50 restaurants that line the Mall with cafés, window displays, and buskers." In summer 2014, and again in 2015, the Downtown Denver Partnership and Downtown Denver Business Improvement collaborated on several Meet in the Street Sunday events, rerouting the Mall Shuttle to adjacent streets and opening much of the mall to pedestrians and cyclists, and featuring various fun activities to bring people together. ↑ Proctor, Cathy (2015-08-25). "New 16th Street Mall shuttles to be all-electric, quiet, less smelly". Denver Business Journal. ↑ Nelson, David M. "Thinking Beyond the Station". Project for Public Spaces. PPS. Retrieved 9 February 2015. ↑ Hendee, Caitlin (2014-07-21). "Downtown Denver's Meet in the Street event steps toward urban engagement". Denver Business Journal. Regional Transportation District webpage Provides Mall Shuttle information including frequency by time of day. - 16th street mall an entertaining place.